"The music created with this humble Strat has entered into the homes and lives of quite literally billions of people..."
A superb new book, written by Phil Taylor, David Gilmour's long-term guitar technician, studio manager, production director and much more, takes a careful and detailed look at one of rock's most iconic instruments. 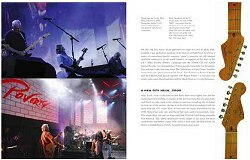 Rather than a dry, technical manual, suited only to those who already know guitars inside and out, it is a rewarding and accessible book that Pink Floyd fans the world over will thoroughly enjoy. Phil explains that the book explores the history of DG's black Strat from its early days as David's primary guitar in Pink Floyd. Through the pages, one finds out how and why the various modifications have taken place, changing the instrument pretty comprehensively from the standard model bought in 1970 at Manny's Music in New York. For those that understand the phrase, it seems a real "Trigger's broom"! The first thing that strikes you is the sumptuous design and quality of the book. The gang at StormStudios have done a fine job with the inside and out of the front and back covers, the majority showcasing the wonder of nature via a weird rock formation in Arizona. On the back itself, there is a clever image featuring an unexpected take on the classic black Strat image. The book itself is laid out in a fresh, clear and clean format, balancing text nicely with the fine array of pictures. These come from various sources, including the archives of Nick Mason, Jill Furmanovsky, Polly Samson, and Phil's own behind-the-scenes shots. From pictures of David at Abbey Road during the sessions for A Saucerful Of Secrets, in 1968, right up to the recent Live8 and On An Island activity, every aspect of David's career is covered in an enthralling text. With Phil's enviable position at the heart of things, plenty of detail is revealed on events which has not been shared before. The book also covers some of David's other guitars, explaining where and why they were used, and how they were more suitable in some circumstances than the black Strat. Indeed, for a while, the guitar fell out of favour and it took a special event to get it back into action. All of this discussion is fitted into a good summary of the band's key tours, albums, and performances. The text never delves into fiendishly technical minutiae, making it very accessible for all of us who are not guitarists. For all those who thought an interesting book couldn't be written focusing on one guitar (and this would seem to include David himself, based on a quote from him at the start of the book! ), this will prove a delightful surprise. 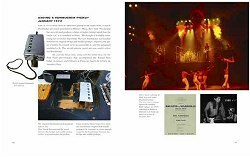 The first edition book was a limited edition - sold online from the special website - www.TheBlackStrat.com - remaining copies will be part of the Fender DG signature model package of goodies to accompany the guitar. The second, expanded and hardback edition, will be available from all good retailers. UPDATE: The hardback edition is being published by Hal Leonard, on September 22nd, 2008. It can be ordered through the following special links, which give a healthy discount from the recommended retail price at time of writing: Amazon UK, Amazon US/International, Amazon Canada, Amazon Germany, or Amazon France.